Curly-headed stylist Victor Sabino believes silicones have gotten a bad rap. "There are all kinds of misconceptions that all silicones dry out the hair, and it's not true," says Sabino of the Sabino Salon in Scottsdale, Ariz. and creator of the Sabino line of hair-care products. "It frustrates me every time I hear stories." Sabino believes silicones actually can help the hair by serving as a barrier against damage from appliances and the elements while keeping out frizz-causing moisture in the air. His line of products is designed to protect the hair from all forms of external moisture and humidity while maintaining the right internal moisture content. "I've found through testing that it does no damage to the hair, and I've seen dramatic improvements. I've seen damage reduced," Sabino says. Moisture Block, aimed primarily at the curly-haired market, uses two different dimethicone polymers in a non-water-soluble formulation to create a moisture barrier. It is designed to keep humidity from penetrating and keeping it smooth, shiny and manageable without frizzies. Another misconception about silicones is that they build up on the hair. While that may be true with lower-quality silicones, which often are mixed with other ingredients, he says his formulation contain "the highest grade of silicones that money can buy" and does not cause build up. He calls his products shampoo soluble, not water soluble. "Once it's applied to the hair, it surrounds the hair shaft and holds to it until it's shampooed out," he says. Victor Sabino created Sabino hair products. Sabino is no newcomer to the hair-care industry. He has been a stylist for more than 35 years, founding OGGI International of Beverly Hill, known for its Root Lift volumizer. His company was one of the first to design spray leave-in conditioners. While working at his salons in California, he was a "stylist to the stars," working with such celebs as Meg Ryan and Sylvester Stallone. He has appeared in such magazines as Vogue, Elle, Brides and Cosmopolitan. Sabino considers the creation of Moisture Block to be one of his greatest triumphs. He says he developed the product because of his own frustrations with what was on the market for people with curly hair. He worked with a chemist to come up with the formulation and tested it on more than 500 women, traveling to humid places such as Hawaii and Louisiana. He says it held up against every possible condition. It took him a year and a half to develop the product. 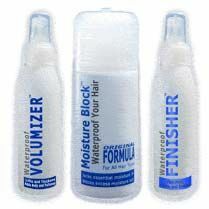 Moisture, he says, is the single most important factor in determining the way your hair looks. Problems arise when the hair has either too much or too little moisture. In high-humidity climates, when the moisture level rises above 11 percent, curly hair can get frizzy and unmanageable. Too little moisture, on the other hand, can make the hair look and feel like straw. Sabino's popular Moisture Block uses a blend of polymers to form a moisture barrier on the surface of the hair, reducing the rate at which water moves into or out of the hair follicle. Too often, he says, conditioners can't do what they need to do because they don't stay in the hair. To bring out natural curls, Sabino suggests applying Moisture Block in one-inch sections and twisting them, letting them dry naturally or drying them with a diffuser. To straighten curls, apply Moisture Block to wet hair and dry it with a vent brush and apply more with your fingers and brush through. If you use a flat iron, Moisture Block liquifies when heated which allows it to spread evenly through the sections. For summer, he suggests applying Moisture Block before going swimming to prevent chlorine damage. It can also be used on the skin to soften feet, hands and elbows; to reduce lines around the eyes; to prevent bumps after waxing and to prevent peeling after a sunburn. Sabino's hair-care line also includes the Volumize, which creates volume lift and body, and the Finisher, a non-sticky, soft-hold hair spray. Like Moisture Block, they are water proof. "We have a very loyal following for these products," Sabino says. "So many people are hooked. They beg me 'Never stop making it!' One client calls it 'the magic stuff.' "